Be the first to share your favorite memory, photo or story of Mechthild. This memorial page is dedicated for family, friends and future generations to celebrate the life of their loved one. 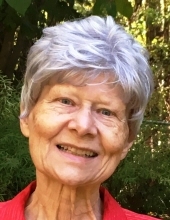 Mechthild Maria Vogt, of Fayetteville , passed away peacefully in her sleep on April 7, 2019, after a long fight with cancer. She was 71 years old. Mechthild was born on April 28, 1947 in Mindelheim, Germany. She was the third child of Margot and Dr. Leopold Vogt. She grew up and studied in Frankfurt, Germany, and after three years of teaching in the German state of Hessia, she came in 1972 to the University of Georgia to further her studies. There she met her future husband, John Paul Grice. They were married in March, 1976. In 1977, Mechthild and Paul moved to Fayetteville, where both joined the faculty of Fayette County High School. There, Mechthild taught German until her retirement in 2007. She loved to teach and her aim was not only to strengthen the language skills of her students, but also to make them see, understand, and appreciate the culture of Germany through language. In 1980, she started a biennial student exchange program with a school in Germany. Over the years, more than 900 students were given the opportunity to become immersed in the daily life of another culture, and many lifelong and life changing friendships developed. Twice, she was chosen by the Georgia chapter of the American Association of Teachers of German as teacher of the year and the Foreign Language Association of Georgia selected her as their teacher of the year in 2007. To honor her work and commitment outside her regular teaching duties to foster and promote friendship between German and American people, the German Consul General in Atlanta presented to her in 2009, the Bundesverdienstkreuz, the Cross of the Order of Merit, of the Federal Republic of Germany. After her retirement, she continued her work as a volunteer at the local community food bank, the Fayette Samaritans, and in the office of the Christ Our Shepherd Lutheran Church in Peachtree City, even during the last years when she struggled with her illness. Participating in the Church’s bell choir and regular choir gave her great joy: she loved music and singing. She also loved taking care of her garden, planting, and weeding, until her strength left. One of her last wishes was to see the dogwoods bloom once more. She did. She was predeceased by her beloved husband, Paul, who died in 2001 and by her oldest brother, Rainer Vogt, who died in 2015. She is survived by her three children from Paul’s first marriage, Paula Ann (Paul) Hooper, John David Grice, Robert Joseph (Mandy) Grice; seven grandchildren, Christina (Adam) Cruse, Leslie (John) Turner, Mitchel (Megan) Hooper, McClellan (Laura)Grice, Summer Grice with fiancé Andrew, Sherabelle and Zoey Grice; five and a half Great-grandchildren, by her brother Elmar (Jane) Vogt and nephews and nieces Lars (Sabine) Vogt and children Mads, Lina and Hendrik, Majbrit (Jan) Fromme, and son Bent Jorik, Yan Steffen (Christiane) Vogt, Ingrid Irene (Boedy) Pennington, and Maya Clausen-Müller and husband Stefan Müller. A memorial service will be held on Saturday, April 13, at 12 pm at Christ Our Shepherd Lutheran Church, 101 Peachtree Parkway N., Peachtree City, GA 30269. The family will receive visitors at 11:00, prior to the service. Expressions of sympathy may be made in the form of donations to Christ Our Shepherd Lutheran Church, Music and Worship, 101 Peachtree Parkway N., Peachtree City, GA 30269, Atlanta Community Food Bank or The Atlanta Humane Society. To send flowers or a remembrance gift to the family of Mechthild Vogt, please visit our Tribute Store. "Email Address" would like to share the life celebration of Mechthild Vogt. Click on the "link" to go to share a favorite memory or leave a condolence message for the family.